What would be the effect of a citizen’s income (CI), aka basic income or BI, on wage levels – how would employers respond to its introduction? What would be its effect on the supply of labour, and on the total amount of paid work done in the economy? Would we still need a legally enforced minimum wage? This article explores the behavioural effects of a BI, on workers, jobseekers and employers. It first examines contrasting hypotheses as to the effects on wages and labour supply, then use official data to make a rough estimate of these effects for individuals in different socioeconomic and household circumstances. Analysis indicates that a Minimum Wage will remain essential after the introduction of a modest BI, to prevent the latter substituting for wages and job security, especially in the case of individuals in less advantaged circumstances. Frequently mentioned arguments for a BI include two different groups of incentive effects that can’t all take place at once for the same person or household. The first is the category of effects that increase labour supply to employers; that it would help people out of the ‘poverty trap’ and encourage them to get a job, or to move from part-time to full-time work. The second is the category of effects that would reduce labour supply to the market; that it would encourage shorter working hours and more leisure; that it would encourage some people to take time off work to study or to care for elderly loved ones or to do unpaid volunteer work. Which groups in the labour force would increase their ‘offer’ of work to the market and which would reduce it? Under what circumstances, and in response to what level of BI, would people work more, or work less ? We are in the dark here for a number of reasons. Firstly, most previous experiences of anything like a BI have been in other countries, often in much poorer countries than the UK with much more self-employment – Brazil, India and Namibia to mention examples. The US and Canadian experiments of the 1970s (see http://www.cbc.ca/news/canada/manitoba/1970s-manitoba-poverty-experiment-called-a-success-1.868562 and https://www.bostonfed.org/economic/conf/conf30/conf30a.pdf ) were far from ‘universal’, all being a variant of income maintenance for previous welfare claimants only. All we have to go on to tell us what might be the labour market effects of BI are the responses of claimants and employers to previous benefit systems in the UK or in comparable European contexts, and informed guesses about what claimants and employers would do in response to a new type of benefit which has no very similar precedent in nature or scale. Benefit systems have in some instances been found in practice to lead to lower wage rates (Gray 2014). Among these examples, the oldest was the Speenhamland system of poor relief in the early nineteenth century (Polanyi 1957). More recently, lower wage rates, increased precarity and job splitting – leading to jobs with very short hours in place of the full time work that most jobseekers wanted – was an evidenced effect of the high ‘earnings disregard’ levels present in French, German and Belgian systems of unemployment benefit in the 1980s and early 1990s (Gray 2002, 2004). In the UK, Wilkinson (2001) found a ‘Speenhamland effect’ of Working Families Tax Credit. The same argument was made in relation to tax credits when they were first introduced (Bennett and Hirsch 2001). Since 2014, the UK government itself hinted that employers had taken advantage of tax credit, defending their 2015 plan to reduce tax credit allowances (later reversed, but only partly) by saying that ‘the tax credit system had, for too long, been used to subsidise low pay’ (BBC News, 15.9.15, on http://www.bbc.co.uk/news/uk-politics-34260902). This view was underlined by the statement that corporation tax was being cut to ‘introduce incentives for business to remove the need for tax credits with pay rises ‘ (George Osborne’s budget speech on 8.7.15 – see https://www.theguardian.com/uk-news/2015/jul/08/budget-2015-uk-gdp-other-rich-nations-george-osborne ). Thus benefit systems that allow unemployed people to move into employment without total loss of benefit, as in the examples above, can lead to reduced wages. With WFTC (and the later Working Tax Credit), when unemployed people got a job they re-applied for in-work benefits to partially replace their out-of-work benefits, whilst with Speenhamland and the continental disregards (Polanyi, op.cit; Gray 2002) they just kept some of the benefit they had whilst they were unemployed. Such systems, to a greater or lesser degree, alleviate the ‘poverty trap’ where almost 100% of benefits are lost on taking a job, as with JSA, discouraging employment. But unfortunately downward pressure on wage rates is an inevitable effect of allowing unemployed people to keep getting state money when they get a job, if that is all we do. If ending the ‘poverty trap’ persuades some unemployed people to take jobs they previously wouldn’t have accepted because the wage was too low, employers will then find it easier than before to recruit the numbers they want at a lower wage – unless a minimum wage law prevents this . In fact right wing writers (e.g. Friedman 1962, Parker 1989) have argued for BI precisely because it helps and encourages people to take low paid jobs. And if pay falls, it falls not just for those who may be desperate for any job, but for all those changing jobs – and possibly even for those in jobs and staying in the same workplace. Many recent press reports show how easy it is for employers to issue new, worse contracts in the current under-regulated, under-unionised environment. Some defenders of BI argue that if the BI was high enough, a minimum wage law would not be needed – and even that some element of ‘wage subsidy’ is beneficial because it would protect small businesses like rural shops. (Or, one might add, this would help socially important sectors currently placed in serious difficulty by the recent rise in the legal minimum wage, in particular social care). But pay would fall not just for small businesses (including small shops and care homes, which some people might want to have lower costs to prevent them from closing). It would fall for supermarket chains and other corporate giants as well. In any case there are alternative, more targeted, ways of helping small businesses or particular sectors – especially those where, as with social care, the public sector is the main customer. Can we avoid the Speenhamland effect and the poverty trap with a single measure? Probably not , for two reasons, as follows. First of all there is the question of whether a BI would be affordable at a level high enough to enable people to refuse all jobs below whatever we consider to be a reasonable wage level. Secondly any measure which increases labour supply is likely to induce easier recruitment at low wages. BI removes the poverty trap for the unwaged, and many of their job applications are directed at low paid sectors. So BI on its own, even at a high level, is liable to induce wage freezing, or recruitment at lower than previous hourly rates, just as did tax credit and the continental high-disregard systems. This can be avoided by ensuring that employers are obliged by law to pay a minimum wage – as I argued in 2014, such a regulation is an important safeguard against the BI being use to benefit employers rather than employees. However, also at stake are other aspects of labour standards, and these are at issue even with a very high level of BI. Guy Standing (1999) amongst others has argued that a BI is a good defence against precarity – in these days of widespread temporary jobs, zero hours contracts and part-time unemployment, it makes such conditions more tolerable and less exposed to poverty. But if such jobs become more tolerable, employers will find it easier to recruit to them. In effect, such employers would be using state funds as a subsidy to support their practice of laying off workers for the weeks or days they are not needed, rather than meeting the costs of continuous maintenance of their labour force as they do in long-term employment contracts with specified hours. Again repeating the argument of my 2014 paper, limiting the use of temporary labour, and in particular zero hours contracts, is an important form of regulation to prevent this. What is important here is the similarity between a BI and the high disregards in these French, Belgian and German benefit schemes, which did encourage the offer of temporary and ‘mini-jobs’. They were like a partial BI for the unemployed. To combat these effects of encouraging more precarity, alongside a BI we need regulation of zero hours and limitation of temporary work. This is essential if the BI is not to end up subsidising employers who show no long-term responsibility for training or supporting their workforce and want to turn labour supply on and off like a tap. Moreover, the problems of precarity are not solved by a BI without other measures. A prospective landlord or mortgage company will be unimpressed by someone who doesn’t know whether next week’s income will be her wage for 40 hours (say £400) plus her £80 BI, or just her £80 BI. It is creditworthiness and a secure long-term income that gets people a home – which is a good reason for minimising insecurity in the jobs market. A stable and secure income is important for individuals’ credit rating and thus their financial wellbeing, according to journalists’ advice on how to obtain a good credit rating (see for example http://www.telegraph.co.uk/finance/personalfinance/11120400/Martin-Lewis-20-things-you-must-know-to-boost-your-credit-score.html, or http://www.freelanceuk.com/money/How_to_improve_your_credit_rating.shtml). So far this paper has focussed on one potential effect of BI –the increase in the supply of labour. That is, the unemployed would move more easily into employment because they would face no poverty trap, and precarious jobs would become more acceptable. But it is often said that BI would enable people not to work, that is not to work for so long or all the time because they chose study, caring, or volunteering; or not to work because they wanted to refuse exploitative conditions. At first sight these two expectations seem in contradiction to each other; would BI induce more paid work or less? Firstly, it depends on the level of BI compared to average wages. Secondly, the effects would differ between various population groups. Let us consider first the effect of BI on the unemployed. Unemployed people fall mainly into two groups – those receiving JSA and those who are ineligible – plus some eligible non-claimants who feel they cannot meet the very strict conditions, or have no fixed address. The ineligible group are mainly people whose 6 months’ entitlement to insurance-based JSA has expired and they cannot claim income-tested JSA because they have an employed partner . Ineligible unemployed also include those aged under 18. The argument that people are deterred from working by the benefits poverty trap applies mainly to this non-claimant group, because for those on JSA, the benefit conditions are the main factor. People on JSA are currently under such strict rules as to what jobs they can refuse that they are often obliged through fear of sanctions to apply for rock bottom pay and conditions regardless of the ‘poverty trap’ (Gray 2004). The financial incentive effect of a BI (that is, removing the poverty trap) would make little difference to them. What would make a big difference is that BI is unconditional : all the job centre rules about applying for so many jobs each week, with sanctions for even minor rule infringements, would not apply. Current JSA rules have been getting gradually tighter, with sanctions and the imposition of compulsory work-for-benefit placements becoming more common, even since 1996. These aspects of the job centre system, described by labour economists as ‘conditionality’ and by critics also as ‘workfarist (Gray, 2004; Peck and Theodore, 2000) were designed to chase people into bad jobs. According to OECD-reported research, greater conditionality of benefits systems do increase the outflow from unemployment into jobs (OECD, 1994, 2000). That is, greater conditionality leads to an increase in labour supply. Conversely, relaxing the punitive sanctions and workfare regime would enable people to spend longer looking for a good job, or re-training in new skills, with nobody forcing them to take the first offer even if this does not meet their income and job security needs or fully use their skills. That is, less conditionality could be expected to lead to a fall in labour supply; this option to turn down bad jobs would work against the Speenhamland effect explained earlier. If a BI was introduced, it is hard to say which effect would win out – easier recruitment by employers to low paid or casual work because of the cushion of BI, or more difficult recruitment on low wages/temporary contracts because of the end to benefit ‘conditionality’. There was also a UNITE/USDAW motion supporting the principle of BI passed at the TUC itself in 2016. (see http://citizensincome.org/news/the-tuc-votes-for-a-resolution-on-in-work-benefits-and-universal-basic-income/). Over and above the virtue of abolishing benefit sanctions, a BI that was high enough to enable people to refuse low pay or very insecure work would probably reduce the total of hours worked and the number of jobs offered. Some of the worst jobs would not be offered because they would attract few applicants. But if the BI was not high enough to enable people to refuse ‘bad’ jobs, it would have the opposite effect – low pay would be more acceptable and employers would recruit more easily at low wages than if there was no BI. It is impossible to say, a priori, how much would be ‘high enough’ to mark the tipping point or boundary between these two effects, above which labour supply falls. Moreover, the tipping point could vary according to socioeconomic group and region. Turning to people who are not on out-of-work benefits – that is, people in paid work, mothers and other carers, students and would-be students, the level of the BI would be the key factor in their decisions about whether and how much to work. Just as people clearly find it hard to manage on JSA of £73.10 per week, they would probably not stay completely out of work for long on a BI of £70 or £80 per week unless they had some parental support. However for many students that might be riches, given that the maximum maintenance grant of £65 per week in England has just been abolished for new starters. Some parents might work more if they found £70 or £80 a handy childcare grant, but others might want to spend more time with their children. Some older people might find it was enough to make up any deficit in their pension entitlement and therefore retire sooner than they would otherwise. Some full-time workers might do less overtime, and some people (in particular students or those in poor health) might give up part-time jobs. Some people might feel more confident about starting their own business with even a small BI as a cushion in the early stages, rather as they were once encouraged by the Enterprise Allowance Scheme of the 1980s – but they could be people moving out of unemployment or out of jobs they found boring or ill-paid, so the net effect on labour supply is again unpredictable. If a BI were high enough (how high we don’t know) it would encourage more people to work part-time, even those used to quite high hourly rates. For there to be any substantial effect of a BI in terms of people withdrawing, at least by working shorter hours, from jobs they already had, a BI would have to offer enough for them to feel that the loss of income was worth the gain in non-work time. For example if a BI of £150 per week was introduced, this would enable someone to give up 10 hours work per week without loss of income if s/he earned £15 per hour after tax, but to give up 15 hours work per week and have the same weekly income as before if s/he only earned £10 net per hour. But if the BI were only £60, the person on £15 per hour would only feel motivated to work 4 hours per week less whilst the person on £10 per hour might work 6 hours less. The higher the BI in relation to the individual’s hourly wage, the greater would be the likely reduction in labour supply from people already in paid work. The ‘value of leisure’ (whether used as leisure, or for some form of unpaid work or study) clearly varies considerably with the individual, depending on their tastes, commitments and current hourly wage rate. As a rule of thumb, one might expect that if – and only if – people have a ‘target weekly income’ they want, irrespective of the amount of effort it takes to obtain it, the ratio of the BI to the hourly wage rate gives us the maximum number of hours by which they would seek to reduce their work time. So for example, if the hourly wage was £10, a BI of £100 would induce people working 45 hours to seek only 35 hours, and a BI of £140 would induce people to seek 31 hours rather than 45. But things might not be as simple as that, firstly because the value of the first extra hour of leisure may be greater than further hours, secondly because employers are not that flexible, and thirdly because the ‘target weekly income’ may vary with the extent of income security, the effort involved in earning, the costs of commuting, work clothes and lunches, and the influence of other family members in response to the introduction of a BI. Conversely, if we consider new graduates or school leavers, or mothers returning to work, the question might be, ‘what is the minimum extra income I need?’ The higher the BI, the more likely they would be to meet that target with a small number of hours’ work per week. The higher the ratio of the BI to the hourly wage, the more likely are new entrants or re-entrants to the labour market to be satisfied with a small number of hours of work. But independently of the level of the BI, the higher their hourly wage rate the more likely people are to achieve their ‘target’ income with a short working week. So if we want to encourage part-time work to reduce any pressure placed by automation on the ‘supply’ of jobs, a high legal minimum wage would help, whatever the level of BI offered. Clearly not everyone would react to the introduction of BI in the same way. How it would affect their ‘propensity to work’ would vary with the level of wages individuals can obtain, depending on occupation, skills, experience; their entitlements (or lack of them) under the previous benefit system; caring commitments; the desire to study; their partner’s work, their health/disability; and heir closeness to pensionable age. Who would work less and who would work more ? This section attempts to investigate what the effect of a BI might be on the employment behaviour of different groups in the population. Who would respond to a BI by offering more labour to the market – taking a job when they hadn’t before, or seeking longer hours? And who would respond to a BI by reducing their personal labour supply, dropping out of paid work or seeking shorter hours? The method used here is first to consider which categories of people would gain from a BI introduced in the range of £70 to £90 per week for a working age adult, and which categories would lose through paying higher taxes to finance the BI. Both gainers and losers are categorised by their current employment status. They include full time workers, who can vary their hours only by doing overtime in some instances: and part-time workers or self-employed people, both of whom can in theory at least vary their working hours quite a lot, in the case of the part-timers possibly by changing jobs or taking two jobs. Then there are unemployed jobseekers (divided into those claiming JSA and those who are not claiming); people who are medically unfit for employment or whose job choices are heavily constrained by their health; people whose main activity is caring for relatives; students; and those who are still under pension age but wholly or partly retired. Most of these groups can be identified from the Labour Force Survey; however, the published data for 2016 do not identify all the categories in the table separately, and have been supplemented by published LFS data for earlier dates, and from other sources as detailed in the notes. There may be an unintended overlap, thus some double counting, for some categories. Thus the estimates of numbers are very rough, and may be regarded as guesstimates of the rough order of magnitude of numbers pending the possibility of access to the raw data which one could interrogate to provide better estimates of the numbers in these various categories. Further information about sources, and some caveats, is given in the note to the two tables below. Table 1 shows roughly how many people are in each sub-group, and hazards a guess at what the effects might be for different sections of the labour force of a BI in the region of current JSA entitlement or not much higher. For clarity, those whom we can expect would be likely to raise their hours of work in response to a BI are highlighted in yellow and those whom we expect to reduce their hours in grey. This table suggests what might be the direction of change in offer of paid work to the market from each group, considering both the likely effects of the BI itself and the likely effects of higher taxes to pay for it, compared to the current system. The higher tax burden would of course impact on income groups above the ‘breakeven’ level where BI and income tax bill would be equal. 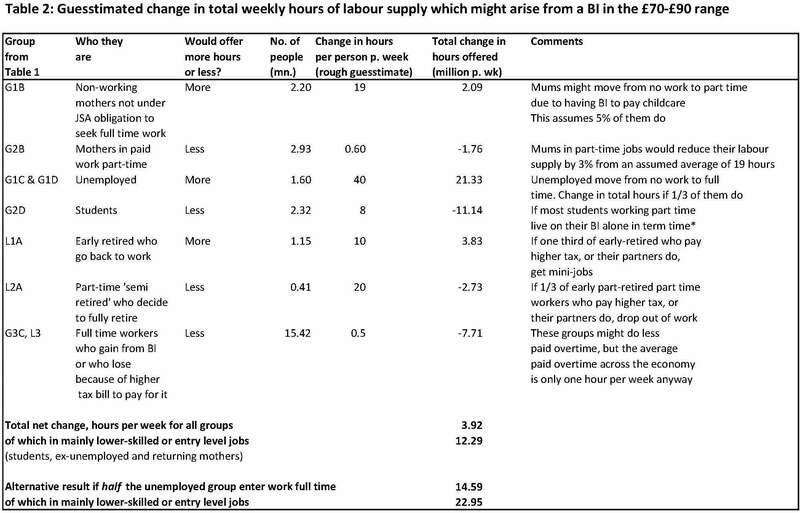 Table 2 shows guesstimates for what might be the total effect on labour supply in terms of hours per week. It should be emphasised that this is highly speculative and needs to be informed by more research on labour supply elasticities and the gains/losses produced by a BI system compared to the current benefits system, as well as by interrogation of the Labour Force Survey and other large data sets to obtain better estimates of the numbers in each labour market category. The guesstimates of what proportion of people in each of the categories would respond by working more or less are mere hypotheses and not based on evidence. However, the table may serve to show the very rough orders of magnitude of the changes expected. In Table 1 there are four quadrants; on the left side are those who are currently not in paid work and on the right side those who are employed or self-employed. In the upper half of the table are the ‘gainers’ from BI (‘G’ groups) and in the lower half the ‘losers’ who would pay more tax than their BI – that is, their income is above the breakeven point. These two variables – in paid work or not, gainers or losers, divide the table into four. In the upper left quadrant (gainers from BI, not employed) we have those with non-economic reasons for staying out of the labour market, plus those most affected by the ‘poverty trap’ in the current benefits system. Unemployed people, if claiming benefit, would be more likely to enter work quickly because their BI would remove the poverty trap, although as noted earlier the effect of removing benefit conditionality would work in the opposite direction and modify this incentive effect. Unemployed people not claiming benefit would especially gain from a BI taking them out of the poverty trap if any money they earn currently results in a loss of JSA or tax credit for their partner. But the published LFS data do not tell us how many of them are in this kind of household situation. So the table makes a very arbitrary guess that half of the non-claimant unemployed are in this situation. In the bottom left quadrant (non-employed ‘losers’ from BI) we have the ‘early retired’ and a few others who are not working by choice – taking a gap year, ‘housewives’ (or ‘househusbands’) without young children, etc. It is assumed that most of these, in particular ‘early retired’ people (those aged 50 to 64, not in paid work, nor disabled nor engaged in care ) are in the ‘loser’ category since they have decided they do not need earnings, so they are probably people of above average means due to wealth, partner’s income or early pension entitlement. Also in the bottom left quadrant, a few early retired people (defined as aged 50-64 and not working or claiming unwaged benefits) might respond to higher tax by thinking their money is no longer enough and they should take a part time job – or keep up some activity in their former profession. In the bottom right quadrant (employed or self-employed, ‘losers’) other workers aged 50 plus, if already partly retired and working part-time, might decide that the extra tax makes it no longer worth working and would retire completely. 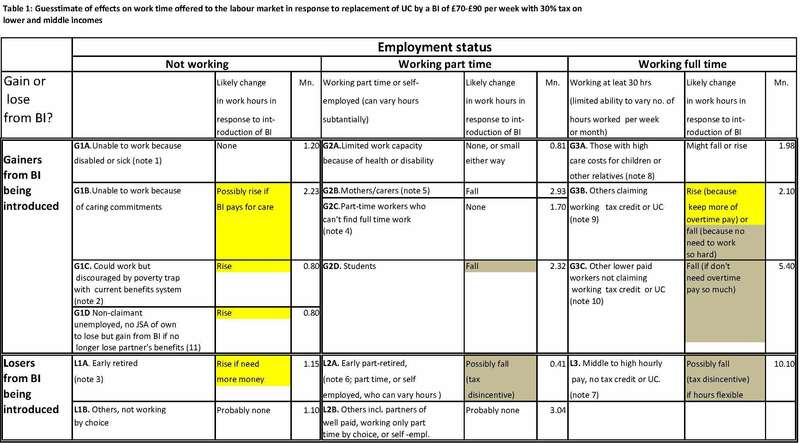 Also in this quadrant are some other part-time workers who are not carers, nor over 50, nor disabled nor students – it is assumed that they have non-economic reasons for their choice of paid hours and that a BI would probably not affect this choice. In the top right quadrant of the table (in paid work, whether full or part time, gainers from BI) we have people who are employed (or self-employed) part-time because of caring or for health reasons, plus students. Many students can be expected to drop their part-time jobs if they had a BI, at least in term time, and this is important because there are over 2.3 million students employed part-time – they are a larger category than the unemployed. Then there are mothers who are in paid work part-time; they might be affected by the poverty trap associated with tax credits, and welcome the lower withdrawal rate of a BI, so they might seek longer hours. However research on American and Canadian experiments in offering something like a BI suggests that women with children tend to reduce their hours (or delay return to work) when offered a BI (Prescott et al. 1986, Hum and Simpson 1993). But if they are lone parents on benefit or their partner is not working (and therefore claiming income based JSA in the current system), they might work longer hours because they would no longer penalised by a loss of benefits from the household as their earnings rise. Blundell, Dias, Meghir and Shaw (2012,2015), when modelling the effects of the 1999 introduction of WFTC, found that more generous in-work benefits overall reduce mothers’ work offer to the market. The change from Family Income Supplement to WFTC in 1999 made the in-work benefits regime more generous with a lower ‘taper’ rate and by starting the taper at a higher level of income. This change was rather like what a BI would do since it offered, in effect, a higher ‘disregard’ of earnings and partial alleviation of the poverty trap. Modelling the introduction of WFTC showed a positive effect on lone mothers’ employment rates – but only very small unless they were home owners. For the much larger number of partnered mothers, there was a negative effect on employment rates of 2-3%, and also a negative effect on their hours. On balance it seems likely that the effect of a BI on the employment seeking behaviour of part-time-employed mothers would be a small reduction in the hours they offer to the labour market. Table 2 attempts to gauge the rough orders of magnitude of these effects, to determine whether it is more likely that a BI would lead to a rise in aggregate labour supply or a fall. This second table takes each of the groups identified in Table 1 and hazards a guess at how large the effect per person in each group would be. Thus, having established hypotheses about the direction of labour supply effect in Table 1, Table 2 offers a guesstimate of how large these effects would be. It suggests that a BI for working age adults in the range of £70 to £90 per week, if all benefits for children and disabled people remain as now, would produce a substantial increase in labour supply, of 3.92 million hours or the equivalent of 98,000 full time workers. Compared to the overall 31.56 million people in paid employment or self-employment, this seems small – but in certain sectors and places where jobs are scarce, it could have a substantial effect on wage levels. As shown at the end of Table 2, there is a particularly large increase in labour supply for unskilled or entry level jobs – altogether possibly almost 12.3 million hours. This is a very powerful argument for keeping a minimum wage law in place. The overall result is highly sensitive to the size of the effect on the unemployed, which is likely to be the largest of all the effects on separate labour force groups. Alongside the effect on the unemployed, there would be substantial effects on students and mothers. The potential increase in labour supply from the unemployed, if the BI reduced their number by one third, would be perhaps 21 million hours per week. But the contrary fall in labour supply from students might be over 11 million hours per week. This is useful to the job prospects of the unemployed, since they often compete with students for unskilled part-time jobs. For mothers, the effects are particularly unpredictable and would depend a great deal on what regime is in place to help with childcare costs, as well as on the income tax rate. In the table, if a 5% increase is assumed in the number of working mothers and their average hours were 19 per week (as estimated by Alakeson, 2012), this would lead to an increase in labour supply of 2.09 million hours. Full time workers who do not currently get WTC but who would gain from BI might reduce their overtime, which in aggregate amounts to a large effect even though paid overtime per person across the labour force is very small anyway in the current state of the economy. The full time workers who don’t gain from BI, but find themselves with a higher tax rate than before or in a higher tax band, might also do less overtime because of the disincentive effect. A guesstimate is a fall of 7.7 million hours per week, if say average overtime per worker was reduced from one hour to half an hour across all these full time workers. The interesting points shown by this series of guesstimates are that firstly whilst the effect of a BI on unemployed people’s job seeking and job acceptance is the largest effect, the effects on mothers, students and choice of retirement age are also important. Whereas much discussion of the labour market effects of BI has focussed on the unemployed or ‘prime age’ full time workers, the responses of other groups in the labour force may be of considerable impact on the likely change in overall labour supply. Despite the likely fall in students’ working hours, one would expect a large rise in labour supply will be at the lower end of the pay ladder, making the retention of a minimum wage very important. It must be emphasised that the guesstimates of both size and direction of the labour supply effects mentioned here are highly speculative, and no more than an initial sketch of the several different effects that need to be subjected to proper econometric modelling in order to assess what would really be the effects of introducing a BI. If we now consider a considerably higher BI – say £150 per week – it is likely that some full time workers with no caring commitments and of ‘prime’ working age would reduce their hours to part-time, if their job conditions permitted that. There would probably be a demand for three or four-day a week jobs. Here the previous analysis about the trade-off between the hourly value of leisure and the wage rate comes into play. If people did reduce their income from work it would erode the income tax base, which must be taken into account in assessing how large a BI would be affordable. Ensuring that a BI does not induce a fall in the tax revenue used to pay for it is one of several reasons why it would be desirable to fund it partly from non-income tax sources – such as taxes on personal wealth, land value tax, capital gains tax and corporation tax. Bennett, Fran and Hirsch, Donald, 2001. Balancing Support and Opportunity, in Bennett and Hirsch, eds., The Employment Tax Credit and issues for the future of in-work support, Joseph Rowntree Foundation, downloaded from https://www.jrf.org.uk/report/employment-tax-credit-and-issues-future-work-support on 4.12.16. Friedman, Milton 1962. Capitalism and Freedom, University of Chicago Press. Gray, Anne, 2002. European Perspectives on Welfare Reform, European Societies 4,4; 359-80. Gray, Anne, 2004. Unsocial Europe; Social Protection or Flexploitation. Pluto. Hum, Derek; Simpson, Wayne (1993). “Economic Response to a Guaranteed Annual Income: Experience from Canada and the United States”.Journal of Labor Economics. 11 (1, part 2).JSTOR 2535174. Jordan, Bill, 1998. The New Politics of Welfare: Social Justice in a Global Context, Sage. Parker, Hermione,1989. Instead of the Dole, Routledge. Peck, J., and Theodore, N. 2000. Work first; workfare and the regulation of contingent labour markets, Cambridge Journal of Economics, 24.1; 119-38. Polanyi, K, 1957. The Great Transformation, Beacon Press, Boston. Prescott, David, Swidinsky, Robert, and Wilton, David, 1986. Labour supply estimates for low-income female heads of household using Mincom Data. Canadian Journal of Economics, 86:134-141. Standing, Guy,1999. Global Labour Flexibility; Seeking Distributive Justice, Macmillan, Basingstoke.